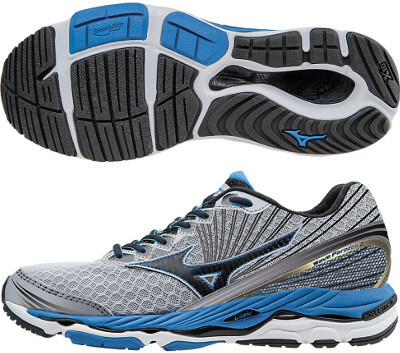 Mizuno Wave Paradox 2 are stability cushioned running shoes. The Mizuno Wave Paradox 2 targets runners who need pronation support and are looking for great cushioning and premium materials. Sharing some latest technologies released in its smaller sibling the Wave Inspire 11, the Wave Paradox 2 features the full-length composite Double Fan Wave for enhanced stability and smoother transition. The other major change from its predecessor the Wave Paradox is the new upper based on the already known lightweight and breathable AIRmesh™ from the Wave Inspire 11 with improved fit provided by internal stripes (Dynamotion Fit™) and several printed lines wrapping around the heel and midfoot following the movement featuring a secure transition. Outsole has not only been redesigned to improve flexibility and stability but also becomes thicker for increased durability. Cushioning, shock absorption and reactive stride have been improved with most modern materials from the japanese brand like U4ic and SR Touch providing extra comfort to heel strikers.